If you’re new to backpacking, or you’re unfamiliar with the Sipsey, it’s an excellent destination for multi-day trips. 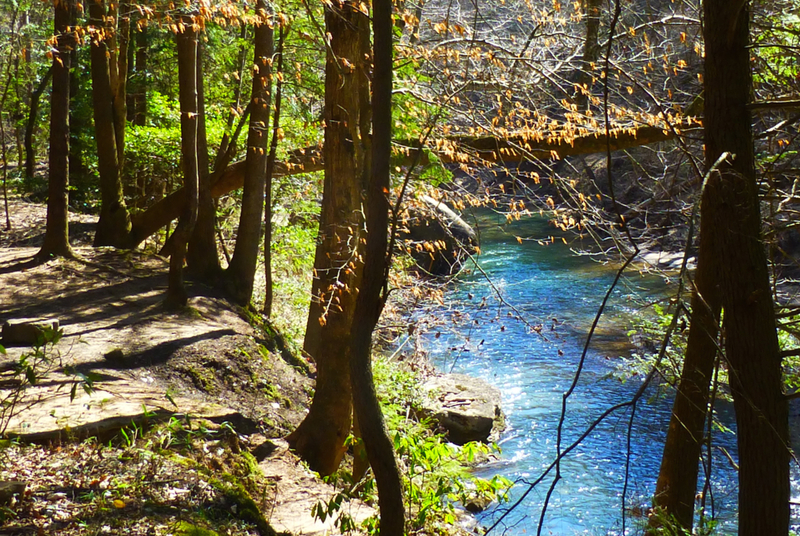 Located a few miles south of Moulton, Ala., this wilderness area is easy to access, but the extensive trail system takes you deep into the forest for a real escape from civilization. Because Wilderness areas are kept in a relatively pristine state, the Sipsey has minimal trail signs and several unofficial, unmarked paths. Because it’s a little tricky to navigate the area, I advise first-timers—especially novice backpackers—to avoid overly ambitious routes for their first trip. About a mile into the hike, Trail 200 passes through the “Fat Man Squeeze,” which is a narrow fissure in a huge boulder. Shaped like an L, the Squeeze extends about 10 yards and narrows near one end, so you’ll need to remove your backpack for a moment and slide it ahead to wiggle through. While a small amount of daylight creeps into the tunnel, you might want to don your headlamp before you enter. Also, the ground in the Squeeze is often very muddy, and water drips down the rock walls, so prepare to get messy. 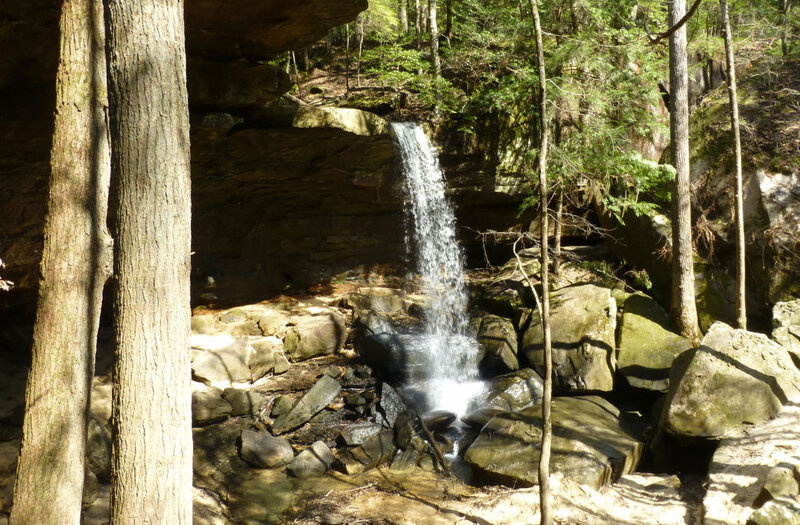 About 2.6 miles into the hike, you’ll leave Trail 200 to cross Borden Creek and travel northwest on Trail 209. Here there’s no bridge, and beginner backpackers can gain experience crossing wild streams. While the creek in this spot can be thigh deep, the crossing is pretty safe, because the current usually isn’t swift, and there aren’t many slick rocks to negotiate. To keep your socks and feet dry, change into sandals or water shoes before you cross. While this route includes a couple of obstacles, it also offers opportunities to unwind. For most of the hike, you’ll walk near numerous shallow pools of water perfect for swimming, and boulders on the banks provide good platforms for napping. At times, trails 200 and 209 hug the creek banks, but they also rise to reveal lofty views of the water channel. Through the feathery branches of hemlocks you can see the sun dancing down long, winding bands of turquoise water. 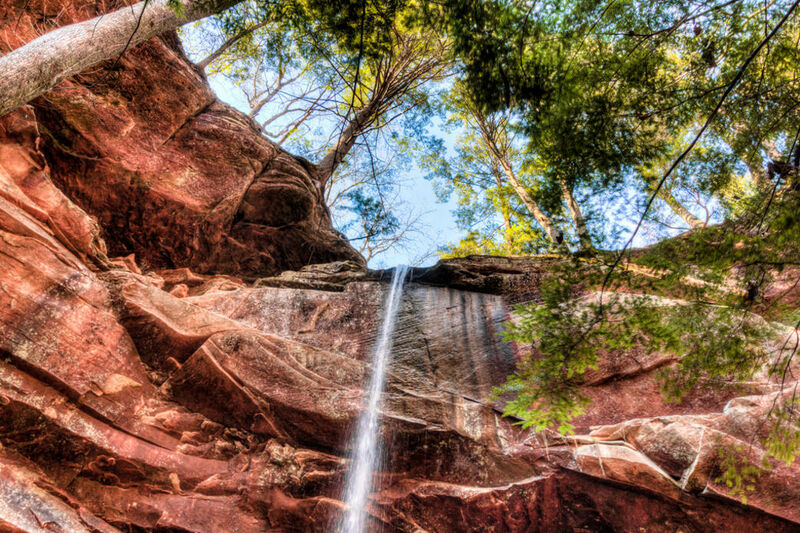 In many areas of the Sipsey you’ll find waterfalls, and three miles into this hike a 90-foot curtain of water plunges over a bluff. Around the bend from the waterfall lies a small campsite that shoulders up to building-sized boulders. With the muffled roar of the waterfall serving as a soundtrack, this is a great spot for people who like to sleep with white noise. Another half mile down Trail 209, a campsite with space for two or three tents sits in a shady stand of hemlocks. 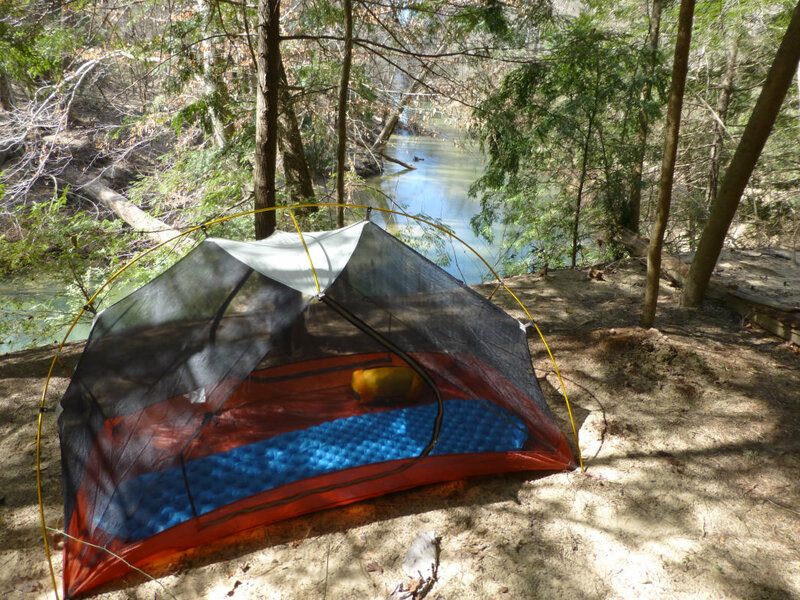 Perched high above a river bend, this camping area allows a 180-degree view of the Sipsey River. When I first started backpacking, my buddies and I always left the house late, because we would realize at the last minute we hadn’t packed something. Even if you get behind schedule, you can still get to the Borden Creek Trailhead fairly quickly, as major roads extend deep into the wilderness to reach the trailhead, you’ll drive just a couple of miles on a gravel forest road. Once you’ve arrived at the trailhead, you can reach a campsite in a couple of hours. Because the hike in is only about 4 miles, you could get a late start and still have plenty of daylight to reach camp. Also, this route involves little elevation gain and loss, so hikers can move quickly. Even people who aren’t in top physical condition, or aren’t accustomed to carrying a large pack, can handle this trip. When planning a backcountry trip, you also have to consider the availability of water along the trail and in camp. 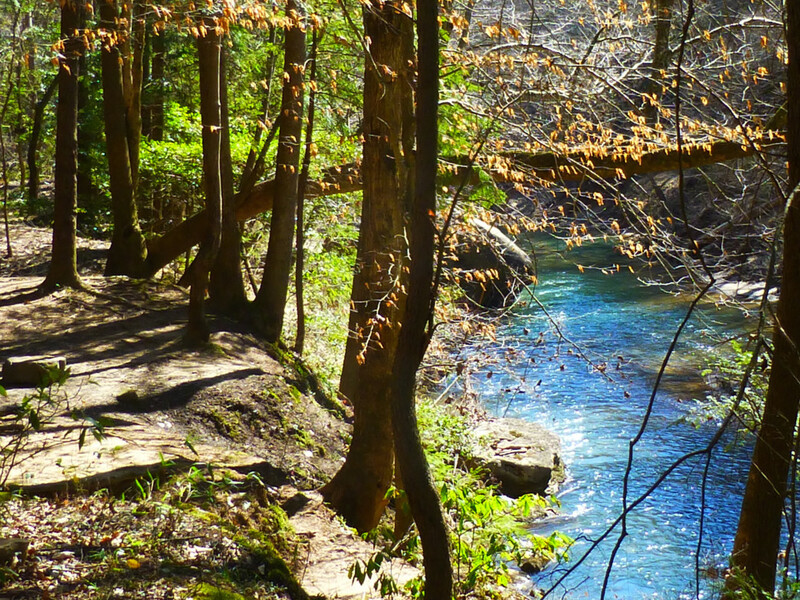 With this route (and many other hikes in the Sipsey), water is plentiful, and most campsites lie within a few yards of a creek. Because these particular trails are so hiker-friendly, people flood them on holidays and weekends when the weather is nice. But, if you visit the area during a weekday or during colder months, you can avoid crowds. Getting there: From AL Highway 24 in Moulton, travel south on AL Highway 33. Travel 13.8 miles and turn right on Winston County Road 60. Travel 0.6 miles and turn right onto FS224 at the Borden Creek Trailhead sign. Travel 2.2 miles to the trailhead parking area. The mileage for this hike begins at the metal gate and trail kiosk at the parking area.